There are plenty of options for escaping to the Hamptons this July 4 weekend. You could drive a car. You could take the train. You could ride the Jitney. But for those who want to really flee the city like it’s a Saigon embassy, the helicopter is the way to go. For the wealthiest of Hamptons weekenders, the helicopter (to the consternation of some locals) has increasingly become the preferred mode of transportation in recent years. And to make a relatively easy trip just a little bit easier, Uber, the app-based car service, will be making its first foray into the helicopter shuttle business this week, Daily Intelligencer has learned. On July 3, from noon to 8 p.m., Uber users can use their app to get picked up anywhere in the city, driven to the nearest heliport — at Wall Street, West 30th Street, or East 34th Street — and flown out to East Hampton airport. Uber is also extending its more traditional SUV service to the Hamptons for the summer, from Wednesday through Labor Day. UberCHOPPER will be operational for this one day only — for now, at least. Josh Moher, general manager of Uber NYC, tells us that the chopper service is an “experiment extending our logistics fabric to new modes of transportation” and that they’ll be “looking closely” at how it goes. 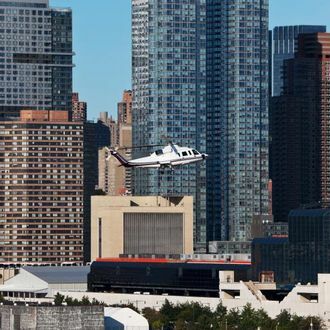 Obviously, getting from Manhattan to the Hamptons in 40 minutes doesn’t come cheap: A ride on UberCHOPPER, which includes trips to and from your aircraft, runs $3,000 total for a copter-load of five people. Pointing and laughing at the Poors idling on the expressway is free, of course.